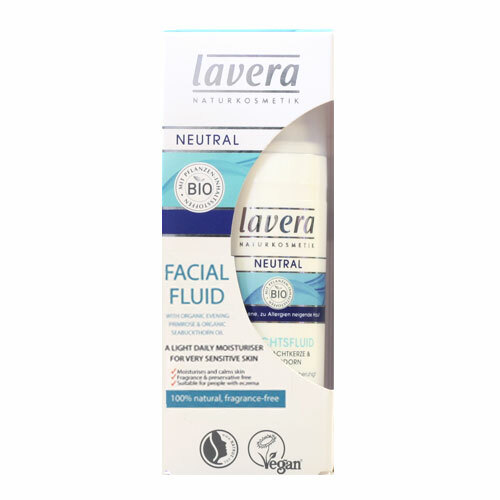 This organic moisturising facial fluid nourishes dry skin. It absorbs quickly and leaves a pleasantly soothe feeling, at the same time it creates a comprehensive moisture balance and refreshes the skin. Prevents further moisture loss and supports the skin`s own regeneration. Nourishes the skin with valuable vitamins and soothes the skin gently. Aqua (Water), Olea Europaea (Olive) Fruit Oil*, Alcohol*, Glycerin, Tricaprylin, Caprylic/capric Triglyceride, Hydrogenated Palm Glycerides, Squalane, Simmondsia Chinensis (Jojoba) Seed Oil*, Shorea Stenoptera Butter, Xanthan Gum, Tocopheryl Acetate, Oenothera Biennis (Evening Primrose) Oil*, Chondrus Crispus Extract, Dipotassium Glycyrrhrizate, Hippophae Rhamnoides Fruit Extract*, Tocopherol, Butyrospermum Parkii (Shea Butter)*, Brassica Campestris (Rapeseed) Sterols, Lecithin, Lysolecithin, Hydrogenated Lecithin, Helianthus Annuus (Sunflower) Seed Oil, Sodium Hyaluronate, Ascorbyl Palmitate. After cleansing apply to the face and neck and massage in gently. 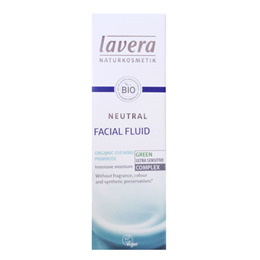 Below are reviews of lavera Organic Neutral Facial Fluid for Adults - 30ml by bodykind customers. If you have tried this product we'd love to hear what you think so please leave a review. Brilliant for my sensitive skin. Also really soothing for my psoriasis, very effective in keeping it moisturised and calming redness so my skin looks clearer.